You know that yourself: you once bought a cinema ticket or booked a flight from a website and since then you receive their e-mail newsletter even though you don’t really want it. In my case, matters are made worse because I move to a different country at least once a year, so I really don’t need cinema tickets in Vilnius or invitations from the British Library anymore. Some organisations make it easy to unsubscribe. One click and you are gone. They are the nice ones. Others make it terribly hard. You need to fill out huge forms, re-confirm your wish to leave, and some don’t offer that option at all so that you need to block their e-mail address manually. They are the evil ones. And then there is Air Baltic, a Latvian airline. They try to appeal to your heart. 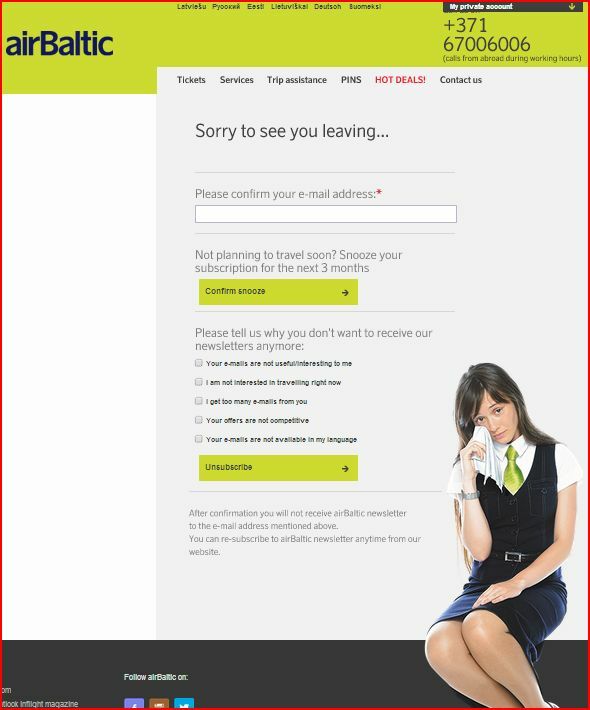 Look at the page you get to when you click on “unsubscribe”: a sobbing girl and the line “sorry to see you leaving”. That makes you think twice, doesn’t it? Well, it didn’t work with me because I have no heart. I also find it quite clever that they offer to snooze one’s subscription for 3 months. Maybe I should offer that on my blog, so that people don’t need to unsubscribe completely just because they have been annoyed or outraged by one of my posts (which happens often). This entry was posted in Latvia, Travel and tagged Air Baltic. Bookmark the permalink. It disn’t work with me too. Most probably because i’m a gay man. They would need to use a sad-looking puppy. I wonder if they also send a crying girl when a woman unsubscribes. I’ll let you know when I do it!